What is a greeter? A greeter is a friendly, outgoing person who welcomes guests and members to worship on Sunday mornings. Bring flowers to members who are in the hospital, recovering from surgery, or are shut-ins. Flowers can really brighten someone's day! Flower bouquets are made at church, and volunteers pick up the bouquets with names and directions for delivery. Take meals to those who are in need due to surgeries, new babies, or moves. Distribute announcement pages and bulletins as guests enter for worship, then help collect the offering. Help prepare the altar and communion for Sunday morning worship services. This ministry takes place at both campuses. Serve the homeless in our county by making breakfast at Interfaith. 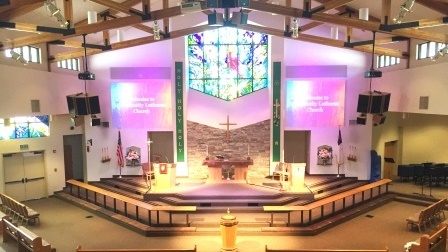 Run audio/visual equipment on Sunday mornings during church services! Provide snacks and/or serve coffee to church members and guests on Sunday mornings. Support our preschool families by becoming a preschool prayer partner! You will be given the name of a student at our preschool to pray for throughout the year. Impact the faith of children by teaching them in the classroom on Sunday mornings.